Founded in 1838 upon the recommendation of Dr. Martin Ruter (1785-1838), as a site for an institution of higher learning. Named in honor of Dr. Ruter, a pioneer Methodist missionary who entered Texas on Nov. 21, 1837 and weakened by his travels, died on May 16, 1838. Later in the year of his death, a company of ten Methodists bought a tract of Land, platted the townsite, and began to build Rutersville. In 1840, Rutersville College was chartered by the fourth Congress of the Republic of Texas as the Republic's first Protestant college. The legislation specified the school should not be exclusively for the benefit of Methodists, and it was patronized by families of various faiths. Rutersville students were noted for their loyalty to neighbors, sometimes spending days away from class, pursuing Indians. The Rev. Chauncey Richardson, A. M. (1802-1852), whose grave is nearby, was first president of the college. The campus was half a mile southeast of this marker. After the Civil War ended in 1865, the original inhabitants of Rutersville sold their property. It was later purchased by German immigrants, whose descendants now live here in large numbers. Rutersville lies about six miles northeast of La Grange in the fertile Rutersville prairie, hog wallow land, near the banks of Rocky Creek. it is located on the Franklin Lewis league. Rutersville is an old historic place. In the early days it was a competitor for the capital of the Republic of Texas. At that time there was a military school owned by the state under the management of Prof. Forshea and a female college under the management of Supt. Thrall at Rutersville. On account of these schools, the town was a local option precinct. These schools were closed during the Civil War and not reopened thereafter. A stock company bought the college and sold it to the Lutheran congregation; they sold it to the Methodists, who for a long time used it for a school. Rutersville consists of a store, a saloon, a gin and a blacksmith and wheelwright shop. It is a voting place of the county and a postoffice. Mr. G. D. Wessels is the owner of a fine hall for dancing, the best in the county. he also is the owner of a first-class saloon. The Rutersville country was settled by Americans and Germans, but now the country is almost entirely German with a sprinkling of Bohemians. Old settlers: C. Amberg, sr. (deceased), Geo. Mauer, B. W. Hobson (deceased), F. Luecke, W. Hancord, the Mohrhusens, H. Harms, Carl Schulz, R. Pohl, L. Struve, Joe Brendel. He was the son of Job Ruter, who was born in Charlton, Worcester County, Massachusetts, on April 3, 1785. Although his blacksmith father could not send him to school, he read widely in English literature and the classics and gained a working knowledge of Hebrew, Greek, Latin, and French. After being called into the ministry, he joined the New York Conference of the Methodist Episcopal Church in 1801 and received his deacon's and elder's orders from Bishop Francis Asbury in 1803 and 1805. After the deaths of his wife, Sybil (Robertson), and two children, he married Ruth Young of Concord, New Hampshire, in 1810. Nine children were born to this second union. Ruter served churches in the New York, New England, and Philadelphia conferences and was a delegate to seven general conferences. Taking a large supply of Bibles, hymnals, and Sunday school books, he headed for Texas in early November with David Ayres as his companion and guide. On November 23, 1837, they crossed the Sabine River at Gaines Ferry, where they met Robert Alexander. In the following three weeks, Ruter preached in San Augustine, Nacogdoches, and Washington-on-the-Brazos and formed a new society at Egypt. By mid-December he was in Houston, where he preached in Congress Hall and met with Sam Houstonqv and other leaders of the government. Ruter stated his plans to establish a college and received pledges for an endowment of six or seven leagues from large landholders. He even drew up several articles of a charter to be presented to the next session of the Texas Congress. Its gay ornaments shine out of sight. And this was erected in the year ’95. This was erected in the year ’93. And this was erected in the year ’91. This was erected in the year ’92. Cigars, tobacco, and candy in sticks. This was erected in about ’86. All of his customers are treated well. Just come around and give us a call. Wm. E. Meyer was the teacher. Can you name others? The following history was compiled by VASTINE MUELLER on May 18, 1992 based upon his research, interviews with former students, and personal recollections. Harms School had its beginning in 1884 when a building was erected on a one acre rectangular plot in the north part of the Henry Harms’ property. No direct evidence is available to substantiate this date except that surviving exes [in 1992] remember the fiftieth anniversary celebration held at the school in 1934. When the school opened, all classes were held in the German language, this being a community of immigrants or first generation children of immigrants from Germany. The initial school term of six winter months was later extended to seven, then to eight months. The State of Texas furnished few books, and as late as 1920 furnished only a reader, arithmetic book, and a handwriting manual with cursive top lines which students copied on blank lines below. Additional subjects could be taken if students purchased the books and paid a teacher fee. 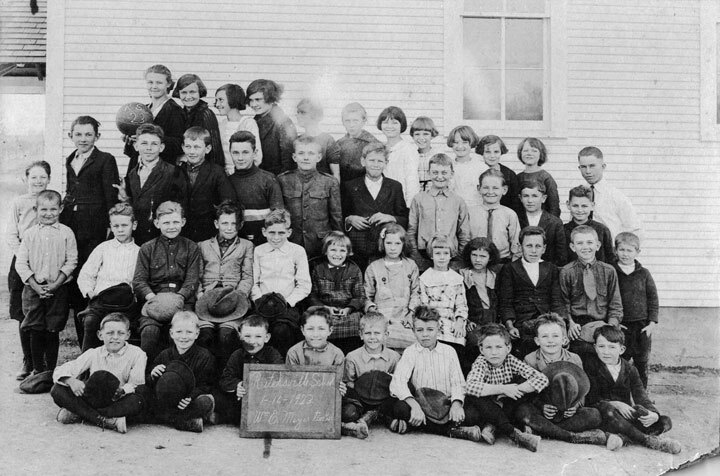 At least as early as 1931, students in the upper elementary grades were taught arithmetic, history, geography, civics, health and hygiene, and spelling. At this time, the State furnished all books, and there were no additional fees. The county-wide examination which, if passed, qualified the student to attend any high school in the county was feared by many seventh graders. This exam was usually held in one of the larger county schools. Neighboring schools traveled to the larger school for the test, which made it all the more unnerving and ominous. This was followed by the graduation ceremony held at the La Grange High School when the students received their first diploma. Harms School’s last year of operation was 1942-43 after which the remaining students were transferred to La Grange Independent School District (LGISD). However, the vote to consolidate with LGISD did not occur until June 7, 1947. The patrons of the community resisted consolidation to the bitter end as evidenced by the vote tally recorded in the minutes of a County Board of Trustee meeting; of the ten Harms District votes, nine voted against annexation. The building was later sold to G. H. Mueller and was razed; the lumber was used on his farm. Its demise was more than the end of a sixty year tradition of neighborhood elementary schooling; it marked the end of a community hub where meetings were held with county agents and local Agricultural Adjustment Act (1933) agents, where exhibits were prepared for display and competition at the Fayette County Fair, and where the community came together to discuss anything of mutual concern. An early photograph from The Fayette Country Record files shows that the school also served as the central point for the operation of the local beef club. At least two dances were held at the schoolhouse after 1934; oldtimers recall that dances were held prior to that time as well. Harms School’s most persistent story, that of its German nickname “Seben Besen,” (sieben Bösen) is largely a mystery to still living ex-students. The story carried forward is that the “Seven Angry Ones” were seven boys in the school (or out of school) who were “hell-raisers” and sometime had to be dealt with by calling in county law enforcement officers. The school building was approximately 36’ by 60’ including a front porch and rear cloakroom. Early photographs do not show a front porch, therefore suggesting that a renovation occurred at some time. The classroom arrangement was simplicity itself. Boys sat on one side and girls on the other, each in a single row of two-seated desks with grades one through seven seated in succession. The teacher’s desk was centered at one end of the room and opposite the entry door facing the students with a wooden bench in front of it. There was a wood-burning heater near the center of the room with wooden benches on each side. Students were permitted to sit near the heater when the room got too cold for students seated in desks far from the heater. Blackboards were located in corners behind the teacher. A kerosene lamp and a world globe hung from the ceiling. Behind the students was a stage in one corner and a filing cabinet in the other. A single Texas county map hung on the wall. The students cleaned and swept the building twice a week. Usually the boys moved the desks while the girls did the sweeping. Even though the school building was locked at night and during the summer, the key was kept on a ledge of the front porch, and everybody knew it. To the knowledge of ex-students the building was never vandalized. During the school years 1935–36 and 1936-37, the state instituted a program of library book reading which was optional for students. The subjects were history, adventure, and some condensed versions of well-known literature. Upon completion of a set of 25 of these and preparing a written book report on each of them, the student received a certificate of recognition signed by the teacher and county superintendent. The books were soft cover and usually were less than one hundred pages in length. The Texas counties map was the source of a bad weather game called “Hangman” in which one player selected a county name and the other attempted to identify it by calling letters contained in the county name. Each incorrect call entitled player number one to draw a portion of a scaffold or the parts of the “hung” player until completed or until the county was identified. Needless to say, Lee or Bee Counties were seldom selected for this game. The school ground was a one acre rectangular plot approximately 140’ by 310’ on the south corner of the intersection of Sandrock and Mueller Roads. The school building was located near the southeast side of the plot. Two outhouses were near the southwest fence and were partially hidden by trees. A band of live oak and cedar trees stood the entire length of the grounds on the southwest side. As late as mid-1920s, there was only one outhouse for girls’ use. Boys took advantage of the woods surrounding the school. Playground facilities were few. There was a basketball court for a while and a softball diamond with well-worn pitcher’s spot, catcher’s spot, and base paths. The rest was native grass, including grass burrs which sometime made the ball hard to pick up. Before a softball game could begin, some students had to move their horses which were tethered to trees near the outfield. When the ball began to unravel at the seams, a student would take it home and have a parent sew it up. A new ball would not be furnished until this process had been repeated several times. Other games played by the children included Annie-over, stealing sticks, marbles, mumblety-peg, red rover, and of course, hide-and-seek. Recess ended when the teacher rang the small handbell kept on the teacher’s desk. When the bell rang, students ran to the pump for a quick swallow of water from the collapsible tin cup that boys carried in their pockets. The rattle made by this tin cup in the back pocket of a schoolboy’s overalls is truly a sound of the past. School business was conducted locally by the county superintendent and three trustees. The superintendent was elected county-wide while the trustees were elected from within the common district. Holding this office during the attendance of Mr. Vastine Mueller (1920’s – 1930’s) was Mr. Robert A. Rauchi followed by Mr. Walter P. Freytag. Mr. Rauchi visited each school at least once a year to confer with the teacher and talk to students. The trustees were in charge of the building and grounds and usually took care of minor items such as mowing and fence repair at no cost to the state. Trustees approved all expense vouchers including the teacher’s pay voucher. According to minutes of the County School Board meetings, the Harms School budget for the 1927-1928 year was $910, typical for the period. The teacher was to be paid a maximum of fifty per cent of the contract unless or until this fund had accumulated. During the Depression, teachers were paid in chits which were usable at local merchants. The merchants could then redeem the chits when funds were available. In the 1930’s, firewood was purchased for $3.00 a cord delivered (probably the major expense item beside teacher salary). One of the nuisance chores required each year prior to the opening of school was clearing the outhouses of black widow spiders. This was done by lowering a can of burning sulfur into the pits a la Hades. Being a trustee was a thankless job, and no one ever ran for this position. Trustees served three-year terms on a staggered schedule so that one was elected each year. Known trustees were Ben Harms, Gerhard Mueller, Herman Mueller, A. J. (Alvin) Brendle, Emil Citzler, Jr., Max Citzler, and Edward Anders. Herbert Mueller recalled that teacher Frieda Janssen lectured students against the evils of smoking. Clarence Gest, Alton Voelkel, and Vastine Hackebeil pledged to her that they would never smoke. All, now deceased, kept their promises. During noon hour, boys sometimes hunted o’possums in the surrounding woods. On one such occasion, Clarence Gest had trouble retrieving one out of a hollow tree and the hour was up. He and those with him debated whether the teacher would consider their situation a reasonable excuse for being late. The Ruether family lived approximately a mile south of the school. They built stiles over the barbed wire fences so that the children could walk a straight course through the woods to school Long after the family moved away, the still visible trail was referred to as the Ruether path. Atlan Citzler completed the seventh grade in 1933 and made the second highest grade in the county-wide finals. Freddie Lee Fritsch made the third highest grade in the 1938 county-wide finals. Vastine Mueller attended eight years without an absence or a tardy. Teachers often roomed and boarded in neighborhood homes. Mary (Baron) Gau, Felix Ziebel, and Mr. Knuckerman lived in the Herman Mueller home. Emil Kern lived in the Emil Citzler and Gerhard Mueller homes. Three generations of the Emil Citzler family attended Harms School: Emil Citzler, Jr., his daughter Viola Citzler Schultz, and granddaughter Verlene Schultz Zbranek. In the winter, the boys would occasionally build a log house using heater wood for walls and piling brush or old tin on top for the roof. Those who brought their lunches from home would have lunch in the log house. In the spring after the trees leafed out, it was delightful experience to have lunch in the trees. County records show that teacher Emmie Schlick paid her fifty cents membership dues to the Fayette County Teachers Institute for the school year 1912-13. At the “Golden Jubilee” observance in 1934, the community recognized the youngest student, Leward Anders, and the oldest living past trustee, Ben Harms. Photographs were taken of the honorees standing beside the Golden Jubilee cake. Rutersville and the surrounding area were settled by Germans who brought their religious background with them from their motherland, Germany. They found a need to establish a place where the immigrants could come together and worship as they had done back in their homeland. Before 1870, some German Lutherans settled near Rutersville and when a piece of the past military school property owned by the Texas Lutheran Synod was offered for sale to them, they accepted the offer in the hope of using the 80 acres for the erection of a college. Pastor H. Merz was employed as housefather. The professor did not meet the desired expectations and soon afterward Pastor Merz was replaced by Pastor H. Pfenninger. The school did not come up to the desired expectations and was sold in 1878, and the small congregation was organized under the name of Lutheran St. Petri congregation. It had joined the synod but soon disbanded because of lack of spiritual care. In 1894, after a significant number of immigrants had settled in this neighborhood, the desire for regular Lutheran services became alive again, and it was decided to build a new church and call a minister. The Reverend Carl Baer was called as pastor and he was to conduct worship services every three weeks. The dream of the church members to have their own church became a reality on October 6, 1895 when the founders of the new church made their plans and followed them through until they were complete. The 1895 founders were Wm. Hencord, Wm. Harms, Wm. Voelkel, Sr., B. Harms, H. Helmken, Sr., Wm. Janssen, Sr., F. Janssen, J. Reuther, G. Gerdes, Sr., C. Fiebig, Sr., G. Speckels, F. Oppermann, D. Stahmer, H. Stahmer, H. Folkens, G. Oeltjen, H. Mein, F. Lucke, A. Gau, Sr., G. Behrens, F. Schulze, C. Giese, H. J. Mohrusen, H. Morhusen, L. Havemann, C. Witt, Sr., C. Witt, Jr., and E. Citzler, Sr. Over 60 members of the congregation today are third, fourth, fifth, sixth and seventh generations of the forefathers of St. John. H. Amberg donated the land on which St. John Church presently stands. 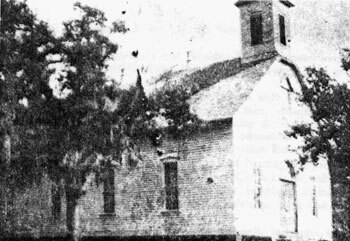 In 1895, a new church was built by Wm. Janssen and his sons. An experienced and capable carpenter, he built the church so solid and strong that even the raging storms of 1900, 1909, and 1915 did not damage the church. The carpenters were C. Treybig and Wm. Janssen, who received a salary of $1 per day to work from sun up to sun down. The first service was held on October 5, 1895 by Reverend Baer. He received a salary of $75 per year, as well as $2 for baptizing a child and $5 for performing a marriage, funeral or confirmation. The church’s first constitution (in German) was adopted at the first church service. (Sometime between 1945 – 1949, the church adopted an English language constitution.) Reverend Baer confirmed about 200 members from 1896 to 1912. The first wedding in the church was for Carl Amberg and Laura Speckels. The Luther League of the church was chartered in 1944, and the organization of a women’s society at St. John’s became a reality on March 31, 1948. The first altar guild was organized under the direction of Aileen Loehr in 1974 and continues to serve in its fullest capacity in 1995. A Sunday School was started in 1912. History notes that the late Alma Stahmer was honored by the church for having taught Sunday School for 50 years. Arthur Citzler served as Sunday School superintendent and Erna Mueller as Sunday School secretary for many years. The statue of Christ that is on the altar today was purchased for $38.10 (probably in 1924); in 1929, pews were purchased for $25 each. The church organ in the early days was the old-fashioned pedal organ. An electric organ was purchased and another electric organ was given as a memorial. The church has been served by many organists. Frances Wied has served as church organist for the last 24 years and continues to do so today. St. John Lutheran Church, Rutersville, will be celebrating its 100th anniversary Sunday, October 22 beginning with worship and Holy Communion at 9 AM. Bishop P. Blom will officiate at this service. Reverend R. Durst of San Antonio, former pastor of St. John, will deliver the sermon at the rededication service scheduled for 2 PM that afternoon. There will also be a blessing of a time capsule to be placed under the new ramp of the new addition to the church and fellowship hall.